When assets are priced with record levels of optimism, reality will disappoint. As Dr. Marc Faber said recently “the art dealers are bullish on art, the commodity traders bullish on commodities, the real estate guys bullish on real estate, the stock traders bullish on stocks, everybody has something to buy.” Therefore the wise contrarian strategy is interest-bearing cash. Over the next few years, most assets will fall in value as risk returns to the market and leverage is unwound. In the future, credit will be extended with greater caution. 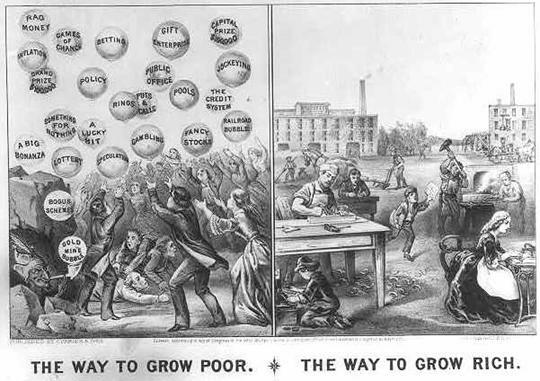 The way to grow poor. The way to grow rich. Lithograph by Currier & Ives, 1875. An economy reliant on debt and speculation is not sustainable. This is as true now, as it was back then. It does not bode well for the United States. Parts of Asia however, especially China, are cash rich and debt free. Their middle class is just beginning to emerge. Just as the crash of 1929 marked the transition of the U.S. economy from the ‘factory’ to the ‘finance’ phase, so this year’s crash will mark China’s economic progression. 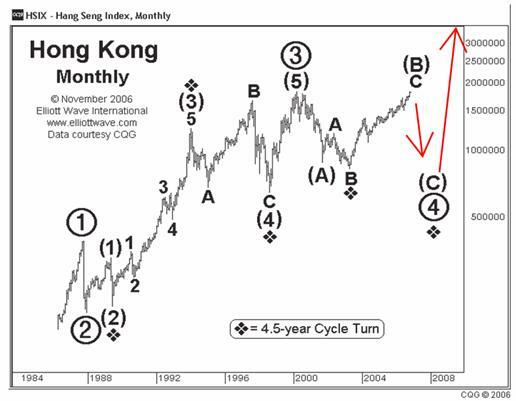 Looking at the chart above provided by Elliot Wave International, the ‘idealized’ long term wave pattern suggests a major sell-off for the United States. In our last article, we discussed many reasons why investors should be selling most assets at this time. The U.S. stock market will struggle sideways for many years under the burden of debt, the deleveraging of its economy, and the weakening of the U.S. dollar. 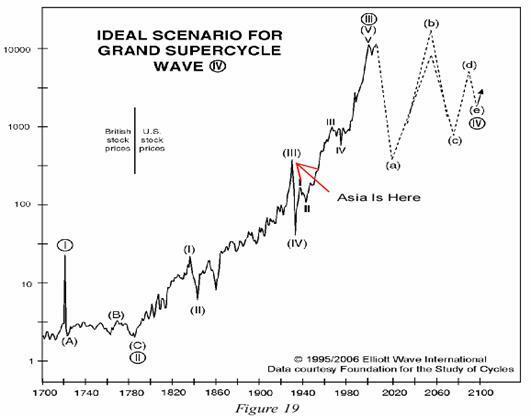 China and other Asian countries, currently in the ‘factory’ phase (similar to the U.S. in the 1920’s), will also undergo a significant correction over the next few years. However, as the Chinese begin to develop consumerism, especially when fueled with debt (‘finance’ phase), their markets will significantly outperform the U.S. The Hong Kong Index and Straits Times (Singapore) Index wave forecasts from Elliotwave.com imply harsh “C” waves down with losses greater than 50% over the next few years. 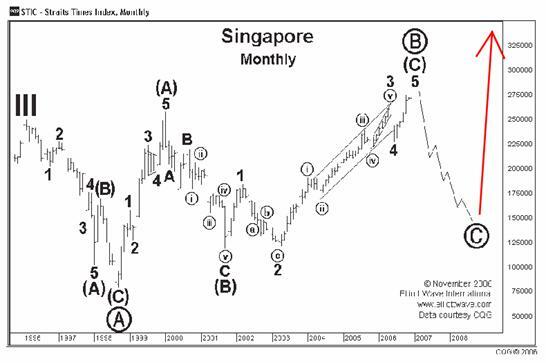 After this major correction, these Asian indexes would complete sideways trading roughly a decade long. Our contrarian analysis also indicates that the U.S. dollar will have a sharp rally during this period. Few investors, foreign or domestic, would be willing or able to invest in these markets at that point. At the market bottom, fearful investors would be scrambling for cash. At that point, we will go against the emotional crowd once again, by advising the purchase of certain undervalued Asian indexes. But in the meantime, asset preservation with cash is the correct strategy.